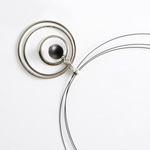 Reinvent yourself or revitalise your look in 2010 with these new Aarikka jewellery designs. From striking coloured necklaces to elegant and eye-catching earrings, see what's new to the Arctic Fashion online shop. This versatile necklace will complement a variety of looks. It has three metal circles with central coloured wooden bead (red or black) and is fastened with a black wire. The Jazz necklace is distinctly different from other Aarikka necklaces, but still only weighs a few grams and is effortless to wear. Perfect for adding a subtle splash of colour, the Polkkis necklace offers understated Scandinavian glamour. It consists of three coloured wooden beads, made from sustainable Finnish wood, suspended by a metal wire. Measuring 42cm long, the Polkkis necklace is available to buy in red, purple and black. For those who prefer gold to silver coloured jewellery, these Oulu earrings will make a great addition to your jewellery collection. Elegant and lightweight, they have an oblong-shaped brown wooden bead with gold-coloured top and end. Available to buy now for only £14, these Aarikka earrings are also great value. 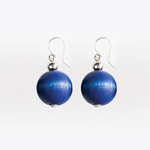 Chic and eco-friendly wooden earrings with two coloured wooden beads and silver hooks. Etydi earrings in purple go perfectly with the Etydi bracelet and Polkkis necklace (both are available to buy on the online shop). These Aarikka earrings are also available in bright red. Make a fashion statement with these vibrant, oversized drop earrings by Aarikka. 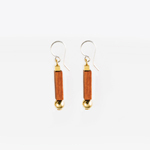 The wooden bead in each Pallo earring measures approximately 1.5cm diameter. With three different colours available, you can choose from attention-grabbing red, cool blue or vampish black.